October 1950 – Princess Elizabeth (now Queen Elizabeth) poses with her daughter Princess Anne who is wearing the Royal christening robe made of Honiton lace. Diana leaves the Guildehall in London, the day she announced her first pregnancy. The Princess was wearing a coat by Belleville Sassoon and a hat by John Boyd. August 1951 – Prince Charles is pictured in the arms of his father, the Duke of Edinburgh on the grounds of the Clarence House. Diana again chose a coat by Bellville Sassoon and hat by John Boyd for this emerald ensemble. September 1960 – Queen Elizabeth II and Prince Philip, Duke of Edinburgh with their children, Prince Andrew, Princess Anne and Charles, Prince of Wales. The Princess in a David Sassoon red maternity dress. January 1965 – Queen Elizabeth II and Prince Philip at Windsor Castle with their children, Prince Charles, Princess Anne, Prince Andrew and little Prince Edward. Ladi Di rests on a Range Rover at the Grand National Racecourse, pictured with Prince Charles. June 1982 – Princess Diana at a polo match two weeks before giving birth to Prince William. The Princess is pictured wearing a maternity dress designed by fashion designer Catherine Walker. Princess Diana wears a fun koala bear sweater over her tummy, supporting her back as she stands with Prince Charles. July 1982 – Shortly after giving birth, Princess Diana attends a service of commemoration at St. Paul’s Cathedral wearing her maternity clothes. Diana stands with Susan Ferguson, wearing a sweet gingham patterned dress. February 1983 – Princess Diana with son, Prince William at Kensington Palace. We love the way Diana rolled up her sleeves, and accessorized with a gorgeous watch and sunglasses. April 1983 – Princess Diana holds Prince William at Government House in New Zealand dressed in fashion designer Donald Campbell. Lady Di kept her pregnancy as comfortable as possible, in forgiving dresses and pretty flats. September 1984 – Princess Diana with her newborn, Prince Harry at St. Mary’s Hospital. A very pregnant Diana chats with her husband, in a baby pink dress and flats. October 1985 – Princess Diana poses with her two sons, Prince William and Prince Harry at Kensington Palace. Lady Di with the royal family at the Trooping the Colour ceremony. July 1986 – Princess Diana carries Prince Harry on her shoulders in Highgrove. Shortly after giving birth to William, Diana still embraces the comfort of maternity clothes for a bit. February 1990 – Sarah Fergueson, Duchess of York attends the Ski Championships while pregnant with her second daughter. March 1990 – The Duke and Duchess of York proudly present their newborn daughter, Princess Eugenie at the Portland Hospital. Lady Di, pregnant with her second son, Harry. The Princess kept with her comfortably-fitting dresses, embellishing with ruffles and polka dots. July 2003 – Happily showing signs of her pregnancy, Sophie, Countess of Wessex joins her husband, Prince Edward for an early evening. Princess Diana chatting with a journalist during a Polo match. On her right Is Madame Estee Lauder. November 2003 – Sophie, Countess of Wessex wearing a poppy at the opening of Childline’s New Counselling Centre. Princess Diana attended an event at the Royal Academy in a lovely white maternity dress, accessorized with the Spencer Family Tiara and a diamond necklace. October 2004 – Queen Rania of Jordan at the Royal Society for Nature Conservation Reserve in Ajlourn. Our favorite photo of Diana: casually chatting with Prince Charles in a bright frock and comfy cardigan. December 2004 – Jordan's pregnant Queen Rania arrives at the lower house of parliament in Amman to attend the opening of the new session of parliament. Diana wore this pale blue Catherine Walker gown to the premiere of "Indiana Jones and the Temple of Doom." May 2005 – Prince Philippe and Princess Mathilde visit provincial School of Agriculture and Horticulure. August 2005 – Crown Princess Mary of Denmark attends a fashion show at Oksnehallen while pregnant. November 2006 – Crown Prince Frederik and pregnant Crown Princess Mary Of Denmark pose with their son Crown Prince Christian of Denmark. April 2007 – Princess Letizia of Spain attends the Biodiversity Conservation awards while pregnant. March 2009 – Princess Marie of Denmark and Prince Joachim of Denmark attend the Culture and Sports Gala while the Princess is pregnant. July 2009 – Bishop Erik Norman Svendsen christens the three month old son of Prince Joachim of Denmark and Princess Marie as Godmother Crown Princess Mary and daughter Princess Isabella look on. December 2011 – Prince Daniel of Sweden smiles as his pregnant wife, Crown Princess Victoria of Sweden attends the Nobel Prize Award ceremony. February 2013 – The Duchess of Cambridge visited Hope House wearing a patterned MaxMara dress and black pumps. March 2013 – The Duchess wore a white Redgrave Goat collarless coat over a dress from Topshop as she visited the headquarters of Child Bereavement UK. March 2013 – The Duchess of Cambridge is seen during her visit to the offices of Child Bereavement UK in a black Topshop dress. April 2013 – During a visit to Scotland, you could see Kate's blooming baby bump, and she was glowing. April 2013 – While in Scotland, the Duchess wore a red Armani coat. April 2013 – Kate attended the National Review of Queen's Scouts at Windsor Castle in a green Mulberry coat, with a positively adorable (and finally visible!) royal bump. April 2013 - Kate wore the 1950s-inspired dress with diamond drop earrings and her hair swept back. April 2013 - Kate was a vision in polka dots as she visited the Warner Bros. set of the Harry Potter films on April 26, 2013. April 2013 - Kate visited Naomi House Children's Hospice and wore a peach coat by Tara Jarmon. Click through to see more royal pregnancy style from one of the world's most beloved women: Diana, Princess of Wales. For these special kids, growing up looks very different than most of their friends. That's because they're royalty, and every step they take is watched from day one. 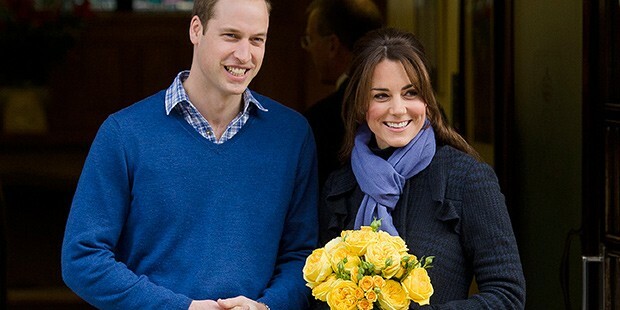 When St. James Palace announced that Kate Middleton was expecting her first child, the world reveled in the news. Speculation began immediately on baby names, baby clothing and baby bumps. While this experience is entirely new for Prince William and the Duchess of Cambridge, for many famous royals, they've been there and done that. Now, the Duchess of Cambridge has been spotted shopping for baby antiques, buying Starbucks coffee, and preparing for baby number one. Not shying away from public events, there have been serious style-spotting moments and we expect many more to come. Click through the slideshow above to take a look at the royal babies and the royal bumps.